Stock # U18563H, 4.8L Vortec 1000 V8 SFI Engine, Automatic, 69033 mi. 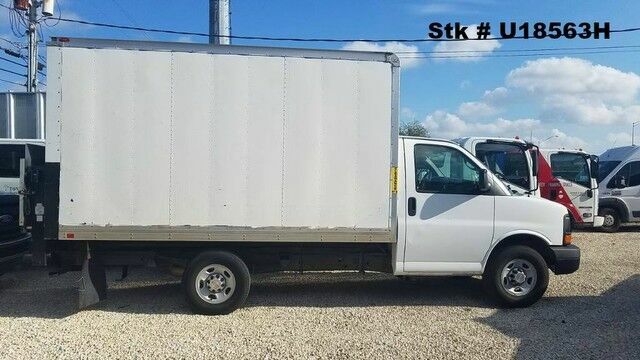 2014 Chevy Express 3500 GVWR9900 GMC 6.0L Gas engine, automatic transmission, spring suspension, hydraulic brakes, steel wheels 17", regular cab, 3-passenger seating, A/C, AM/FM radio, L12' aluminum cutaway box, rear roll up door, translucent roof, hardwood floor, 4 rails/4 e-tracks all-around and aluminum Tommy Gate rail gate. Driver Information Center includes fuel range average speed oil life fuel used ice warning engine hours average fuel economy tachometer and maintenance reminders.